We're going full-tilt right now, appreciating the alternating sun-rain Vancouver spring. A little heat here, a little water there and everyone's happy. 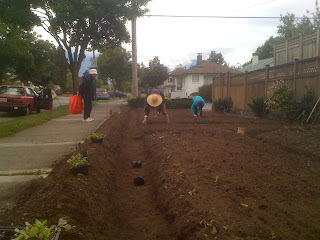 Interns Galen and Michelle and the neighbourhood garden inspector. Progress Report: top notch spacing! Make sure to pick up a copy of the Vancouver Courier this Friday, June 1st. Rumor has it our Head Farmer, C Dumont, is waxing poetically about the virtues of vegetables and the (r)evolution of urban mindscapes.